This is my story, a story of surprises, of love, of fight. A story of life. "I will never forget the summer of 2010. I remember that on the last day of work, before vacation, I went to take a blood analytic due to some bruises that had appeared on my legs. I didn't think it was important. I was tired, had very little appetite (which is weird coming from me), but I thought it was due to the stress in work. Chris, my boyfriend, and me had organized perfect vacations. First, we would visit the country house that my parents had rented in Cantabria and later we were travelling to Croatia, the two of us alone. It was in Cantabria where the bruises began getting worst and I started to feel scared. Thanks to technology we were able to check the blood analytic results over the Internet, which alarmed us. I had very little platelets and I was anaemic. We quickly went to the emergency room. It was night so they were no haematologists available, so I had to spend the night. I already had the feeling then that I was going to spend quite a long period in the hospital. On the next day they did a bone marrow puncture. The wait for the results was everlasting but, in the end, they came. The haematologist told us that she had good and bad news. She was so clever that she asked me what I thought I had. I said leukaemia and she confirmed it. For one second our heart stopped beating. Nevertheless, she kept speaking and told us the good news was it was one of the good leukaemias and that we had detected it early. The complete diagnosis was intermediate-risk acute promyelocytic leukaemia. Oddly enough, the first thing I thought about was about my vacations, my job and my hair. Very absurd, right? This is evidence that we are not able to assimilate this kind of information so quickly. That same morning they transferred me to the Valdecillas Hospital, in Santander, where I began the chemotherapy treatment. My mother was very strong and helped all of the family assimilate the illness. My father had a harder job accepting it. We were in the emergency room and wanted to call my sister, who is my favourite person in the whole world, and who then was living in Brussels. I asked my father if he knew how he was going to tell her (he is also a psychologist, like me). He nodded and dialled the number but the only thing he was able to say was: "Your sister isn't well..." and became mute. 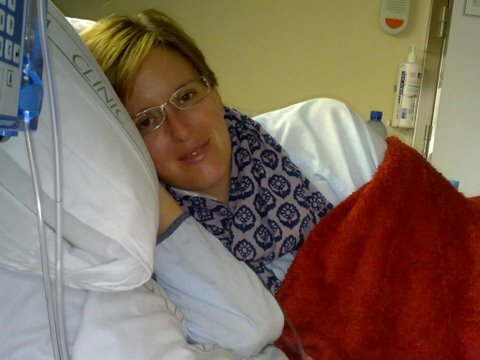 24 hours later, Lucy was in Santander and she took care of me during the whole treatment. After the induction treatment they transferred me to the Clinic Hospital in Barcelona, where I stayed until my blood tests reached the minimum values. Later I continued the chemotherapy treatment, but in the ambulatory. It was during this long month, when a lot of things lost sense in my life (like work) and the importance of having a good support network next to you became evident. All of my beloved ones were next to me: my family, my job colleagues, friends who I thought would never show so much care, friends' friends, it was spectacular. We were brave and assimilated everything with humour. Chris, my love, in the worst moment of my life, without hair or energy, asked me to marry him and put up with the apathy and the secondary effects of the chemotherapy. I am very grateful to scientific research because I didn't have to undergo a bone marrow transplant and was taken care of very well by the haematologist team, especially by the nurses. December 23rd 2012 was my last day of treatment. After two years and a half I am starting a new stage of my life. Leukaemia has taught me a lot and there have been changes in my life; changes to take care of myself, live in a healthier environment, close to my family, with my now husband and working in what I truly love. I want to send a great dosage of humour to everyone who is now going through leukaemia and all of my energy to the team that is taking care of them, because they are fundamental for the patient's recovery."